Hidden away on the hillside, nestled in the Goan jungle, Nilaya Hermitage is an extraordinary getaway, built from local rust-coloured laterite stone, complemented with shades of blue and the lush greens of the surrounding forest. The jungle environment offers up a wonderfully peaceful ambience, with the chirping birds and occasional monkey chatter the only sounds breaking the silence. For beach lovers, the hotel offers a chargeable shuttle service to Candolim. 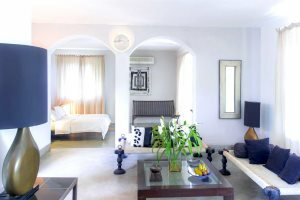 In keeping with the hotel’s relaxed ethos, there are no televisions in the Suites. 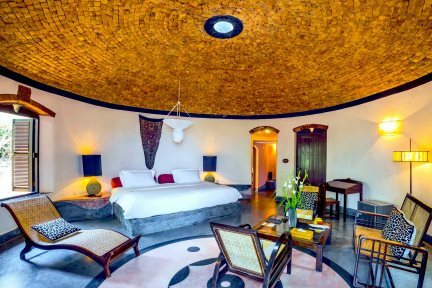 Taking its inspiration from Moorish architecture and tales of the Arabian Nights, Nilaya Hermitage is a unique and striking hotel, blessed by a verdant, hidden location surrounded by the natural world. 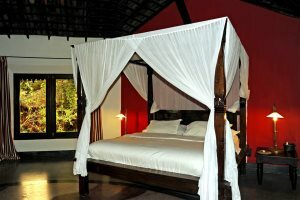 The hotel has been beautifully designed by the famous Indian architect, Dean D’Cruz, with its 13 unique guest rooms scattered around the grounds. This is the perfect place to forget about time and re-discover the rhythms of nature, recharging your batteries as you do so. All the Suites at this intimate retreat have been named and decorated after the natural elements; from the vibrant reds and oranges of the Sun Suite to the soft natural shades in the Earth Suite, they have been uniquely styled and eclectically furnished with rare antiques from ancient Indian palaces. Each room enjoys features such as a king size bed, air-conditioning and a safe, while guests will also enjoy daily fresh fruit and flowers. Fill your days at Nilaya relaxing by the pool, taking yoga sessions or enjoying age-old Indian treatments at the Ayurvedic spa. At night, enjoy the delicious international dishes in the restaurant, perfectly accompanied by a sky full of stars. You can also take some rewarding day trips during your stay at Nilaya, from heading to the beautiful beaches at Candolim and Calangute, to Arpora’s famous Saturday Night Market. "My stay at Nilaya proved to be the ideal escape away from the hustle and bustle of daily life; it’s the perfect place to relax and rejuvenate. 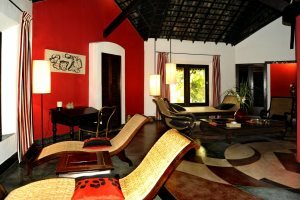 This superb accommodation is in an idyllic location, situated up in the Goan hills, surrounded by forest; a place of beauty and tranquility. We had such a fabulous stay, made all the more enjoyable by the wonderfully attentive staff and delicious food". 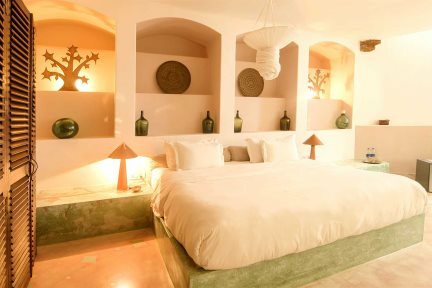 All standard suites are extremely comfortable and spacious, uniquely designed and named after the natural elements. They are all beautifully decorated and have a king size bed, shower room and air-conditioning.